The Revolutionary War started on April 19, 1775 in the colony of Massachusetts. On that day, British forces unexpectedly fired against the citizens of Lexington killing eight militiamen. Their ultimate objective was a large stash of colonial arms at a militia armory in Concord just a few miles west of the Lexington Green. It was there that the colonial soldiers successfully stood their ground, causing the mighty British army to retreat back to Boston. 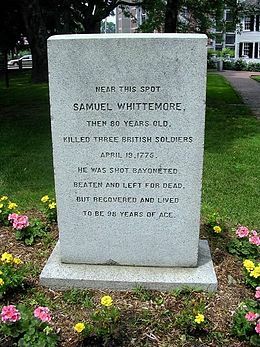 The retreat route took the British forces back near Lexington where 78 year old Samuel Whittemore was waiting. This seasoned war veteran was not going to let the slaughter of his fellow countrymen stand. He singlehandedly ambushed and killed three British soldiers before being shot in the face, stabbed by bayonets, beaten, and left for dead. This old timer’s bravery boosted the spirits of the Revolutionary forces, and his toughness allowed him to recover and live another 18 years. He died a free man under an American Constitutional government. Whether we are old or young, we have a mission to complete. We have a fight to win. We must finish our course while keeping the faith. We must press toward the mark. We must aggressively answer the high calling of God in Christ Jesus. We must urgently serve God and fulfill our purpose. PLEASE PRAY FOR AMERICAN CHRISTIANS TO FINISH OUR COURSE WHILE KEEPING THE FAITH. All Christians, young and old alike, must press toward the mark.